The best way to manage your bankroll for sports betting. 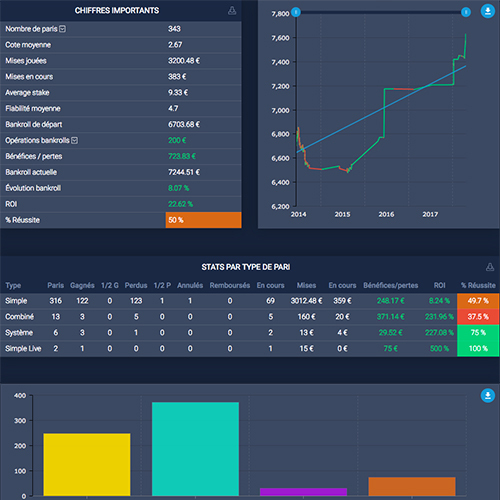 BettingTracker allows you to analyze your results to quickly optimize your profits. 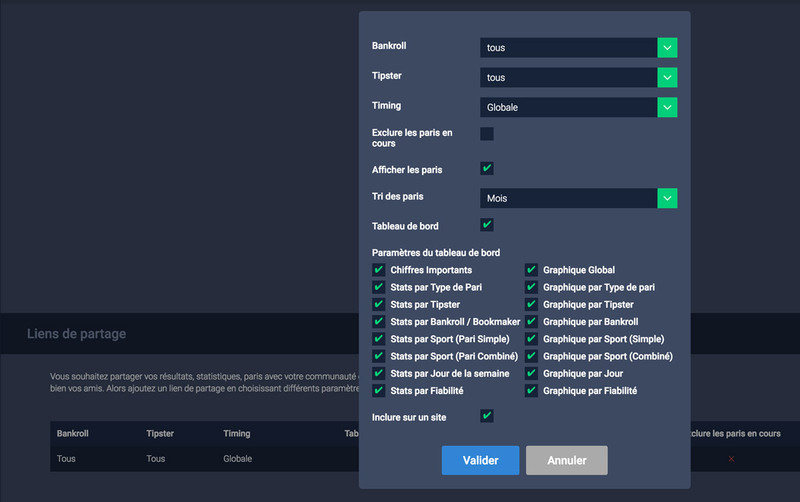 How does BettingTracker work ? 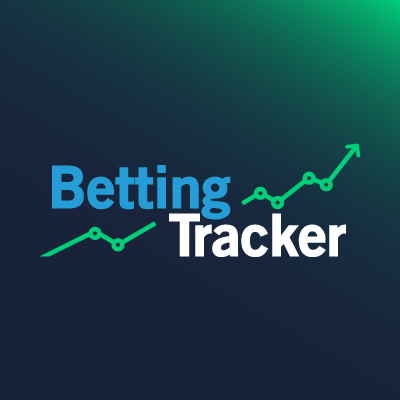 Use BettingTracker to share your stats and bets with your friends or community while choosing exactly what you want to show them. You can also easily integrate our modules on your website. 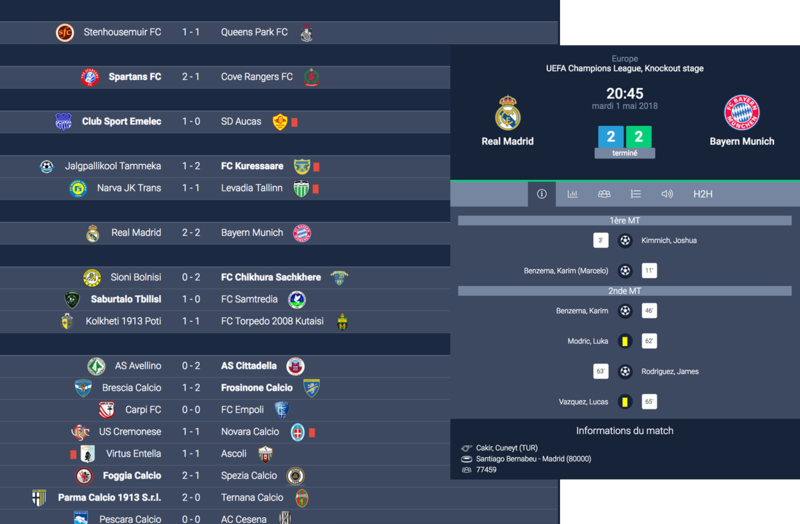 With BettingTracker's calendar, we put the result of your bets automatically up to date. You will also find all live results in your favorite sports. 34 sports with competitions, teams and calendars. Find your bets from our 3,000 registered competitions. 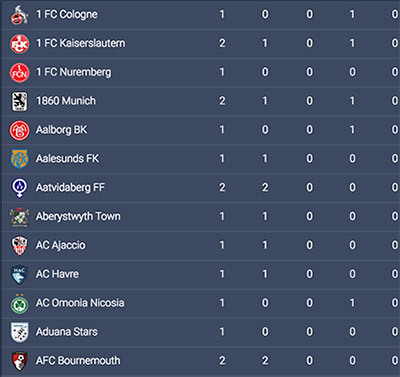 Easily add your bets via our 25,000 teams and players, along with their logo or photo. Set up your bankrolls with our 93 bookmakers. Make your bets fast thanks to our comprehensive database. More than 15000 teams and players, 5000 competitions in more than 36 sports. Find all the events of the day in your favorite sport. Easily add an event to your betting list. 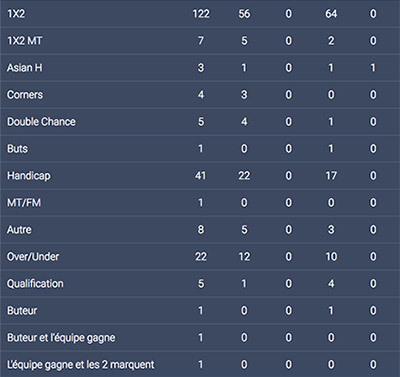 Access advanced and filtered statistics by type of bet, type of event, sport, competition and even by team ! Find live scores as well as statistics, game facts, lineups, comments of the events of the day and past. 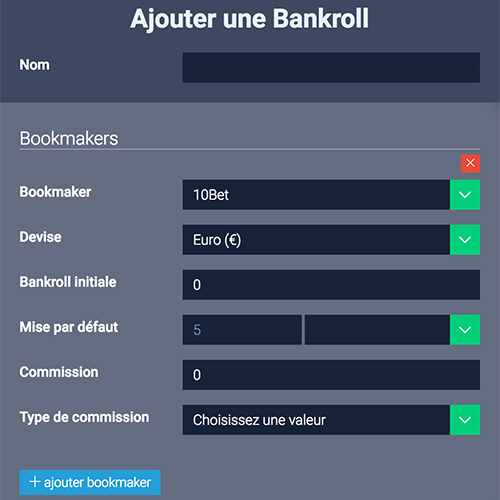 You can give access to your friends, to your fans, to certain information of your bankroll. 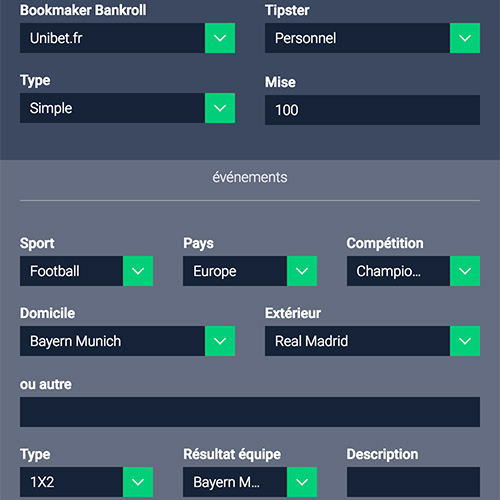 Your bets are automatically updated according to the result of the linked event. Find your filtered statistics formatted by tables and charts. Our tool supports multiple languages and can automatically convert your earnings in the currency of your choice. Set up your account to look like you with your photos, sports list, and even more. Contact our customer service via chat or email. We will be happy to answer you quickly. 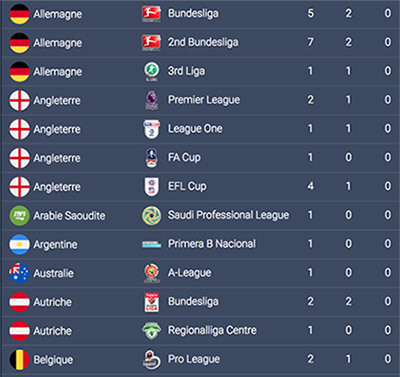 You can easily export the list of all your bets in csv format to keep track of them locally. Remember me Password forgotten ? 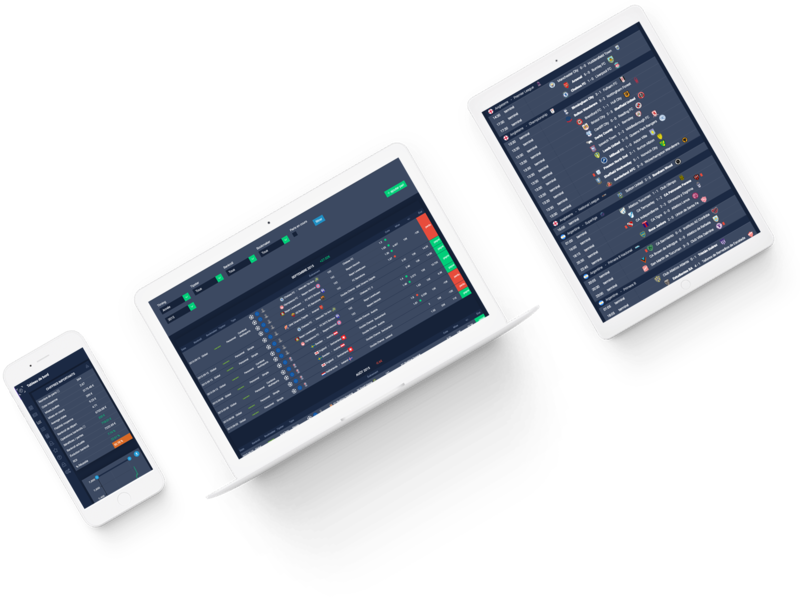 We can define BettingTracker as a companion piece of software that increases bettors' earnings by highlighting errors they may have made.